At first preheat oven to 380 degrees F.
Then place chicken breasts in a lightly greased 9 x 12 inch baking dish. 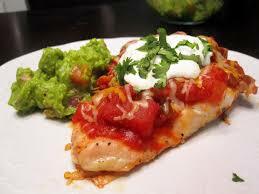 Now sprinkle taco seasoning on both sides of chicken breasts, and pour salsa over all. And now bake at 380 degrees F for 30-35 minutes, or until chicken is tender and juicy and its juices run clear. Then sprinkle evenly with cheese, and continue baking for an additional 5-6 minutes, or until cheese is melted and bubbly. And sour cream top with desired.